Seeing as how we are fortunate to count Paul Gagon as a member here, it seemed like a good time to give him a home to stretch out in and relax a little. Maybe exercise the grey matter and present a little history of the guitar and bass (amps too!) from his perspective as one of the eminent designers of our time. Got questions? Great! Good questions might be, "What kind of windings are on the S500 pickup and why?" Or, "What was the thought process behind the MJ-4?" Troubleshooting questions should remain in the regular forums (he reads those too). Finally, please be mindful of how I feel about tech questions via PM or email. Ken Baker wrote: Below is a letter from Paul to Ed Friedland regarding the setup on Ed's L-2500. It's a tale of the setup capabilities we have in our instruments. Please note that this may have been Ed's M-2500 and not an L-2500. Thank you so much for sending us your finely tuned L-2500 to examine. I have spent considerable time both measuring and playing the bass. I’m not a very good bass player, guitar’s my thing, but this bass plays like butter. I did get a bit of buzzing above the 14th fret but that is probably more a comment on my “playing skills” then anything else. Here are the measurements I gathered from your bass. Please understand that this was done with feeler gauges and was a bit tricky so the accuracy might suffer a bit. Here goes. I measured the neck relief by placing a capo on the first fret and pressing each string down on the 21st fret. I then used a feeler gauge a measured under each string at the 9th fret. The average measurement was .005”. NOTE: Our factory setup for basses calls for a measured neck relief of from .012” to .014” at the 9th fret. Next, I measured the distance from the top of the 1st fret to the bottom of each string directly over the 1st fret and got the following measurements. 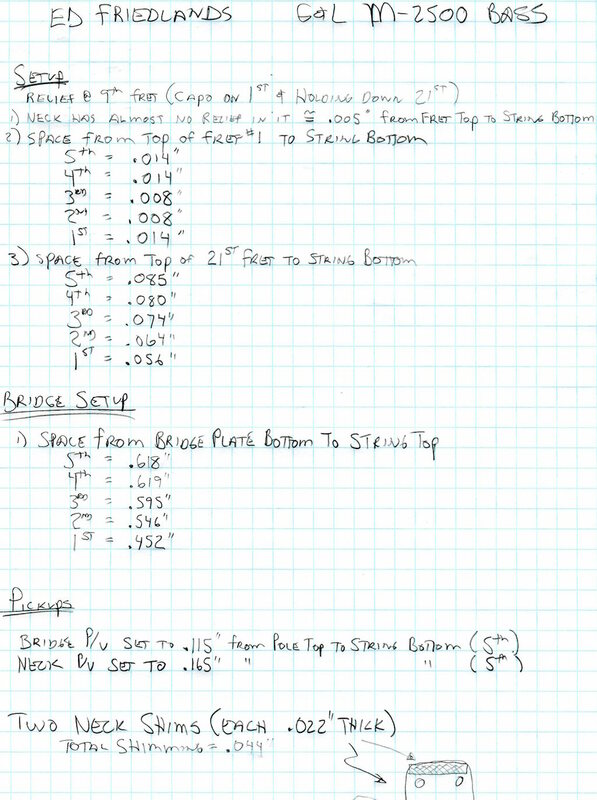 NOTE: Our factory setup for these same measurements is .020” to .022” for all strings. Next, I measured the distance from the top of the 17th fret to the bottom of each string directly over the 17th fret and got the following measurements. NOTE: Our factory setup for these measurements is .094” for all strings. One other measurement I made was of the neck shims. You had two neck shims that each measured .022” thick. This gave a total neck shim of .044” By the way, I totally agree with you about the neck shims. All our basses benefit from them. 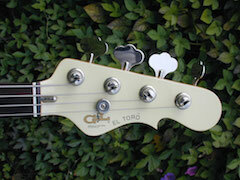 Unfortunately we have many customers that won’t accept them, and in fact send basses back if they find one. Again, thanks you so much for sending us your bass to evaluate. Because we have to ship our instruments all over the world we have to use instrument setups that are able to accommodate a wide variety of climate situations. I totally dig your setup but it would be problematic for us to duplicate your setup exactly. However, your bass has shown us that we can move closer to your direction. I will be working with the plant foreman and setup people to focus in on what you have brought to our attention.